Here are the basic requirments for being a member of the Memphis Grizzlies' dance team: 1) you must have four to six years of dance training (classical, ballet, modern, pom are all acceptable, but you don't have professional or dance team experince). 2). You must be either a full-time student or have a full-time job, in additon to going to practice several nights a week and dancing at roughly 30 NBA games every season. 3.) You have to be able to learn 20 to 30 dance routines quickly and retain them. 4.) You must be able to dance in heels. In their official photos on the Grizzlies' website, the Grizz Girls are lined up in a row, listed by first name only, and, all made up and in costume, they are very, almost intimidatingly pretty. During games at FedExForum, they're constantly in motion. If there's music playing, they're dancing, from the start of team intros to the end of the fourth quarter. They dance in groups in the tunnels, in the stands and on the court, stopping only to applaud the Grizzlies or change locations. It goes without saying that they're all in incredibly good shape. During every home game, the Grizz Girls perform two big dance routines, one in each half. They're only on the court for a few minutes at a time, usually not long enough for a whole song to play. In order to enjoy those few minutes of incredible performance, though, they go through a lot. The Grizz Girls' choreographer, Tamara Moore (a former NBA dancer herself) describes being on the team as "a full-time job with part-time pay." In addition to nights spent in rehearsal (which start with 45 minutes of circuit training), the Grizz Girls perform at every home game and attend community and private functions, which can happen several times per week. Tamara coaches the Grizz Girls during floor practice. Through all of it, the dancers are onstage. "We're Grizz Girls every day, all day," said Grizz Girl, bio chemistry student and self-professed "super nerd" Diamond. 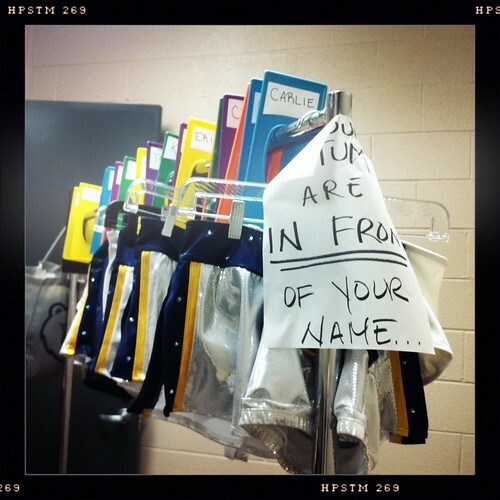 "We have to be actors. The fans want a show. It doesn't matter if you're having a bad day, you have to be positive." The team meets on the court three hours before the game starts to finalize their two big performances for the night. They run through their routines in black sweat pants and sneakers, competing for floor space with giant NBA players who are doing slightly-less-than-half-court scrimmages. Tamara stops and adjusts things, goes over the notes from the last game and reminds everyone to keep their heads, knees and chins up while they dance. It's very easy to forget how big FedExForum is until you're standing on the floor, looking up. About two hours before tip-off, everyone heads to the locker rooms. There's a buffet of fresh fruit, salad, pasta and meatballs set up, and everyone checks to make sure their two costumes for the night are hanging on the rack before they eat. The locker room is big, but until game time, it's a flurry of activity. Every outlet has either a phone, curling iron or hair straightener plugged into it as the girls spend about an hour and a half getting fully prepped for game time. Natactia laces up her sparkle boots. Tamara's mother, who the whole team refers to as "Mom", is on hand to steam outfits, make adjustments and offer advice. Every few minutes, someone will yell "Time on clock?" and someone else will respond with the ammount of time left on the digital clock above the buffet that counts down until game time. There's a marked shift in the room when there are less than 15 minute left. Everyone gets quiter, a little more serious and Tamara walks around reminding people to stretch and get their minds right for the game. And then it's time to go. Before every game, the 12 dancers assigned that night meet in one of the tunnels leading to the court for a quick prayer, a short pep talk and a chant. Once that's over, the game is on, they're on and everyone's smiling. 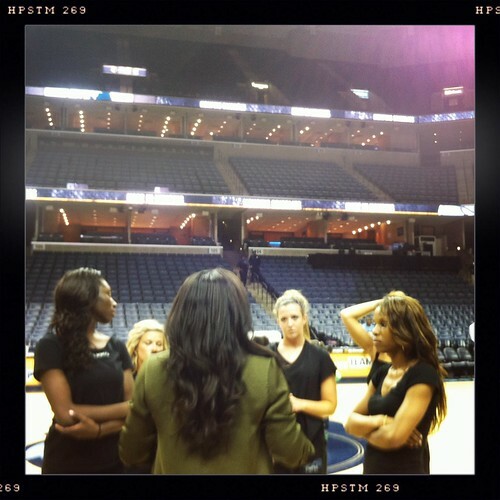 See a full image gallery of the Grizz Girls as they get ready for a game. I did some Q&As with a few of the Grizz Girls, and I wanted to share their answers here. Meet Tabitha (5 seasons as a Grizz Girl), Taylor (third season) and Christina (first season). What's your favorite song / routine the Grizz Girls have done and why? Christina: If I had to pick, I would choose "Drop It Low" because that was my pump up work out song and there is a part in the routine that I love to do. Tabitha: "Burlesque" is my favorite routine because of the high-energy, sassy, and sultry moves. Taylor: My favorite routine would have to be "Burlesque". It is such a fun and flirty dance. The crowd always seems to love it and that makes it all the better. What's it like to perform in front of thousands of people? Do you get nervous? Tabitha: It feels amazing to perform each night in front of thousands. My adrenaline takes over and sends my nerves out of the window. Christina: I love the adrenaline that comes with performing on the court. Nerves are slightly present before the performance, but one the music is turned on I am enjoying every second of the spotlight. Taylor: To perform in front of thousands of people is such an incredible feeling. It's one big rush. I have been dancing in front of large crowds since high school nationals and I still get butterflies before I step out on to that court. Do you have any funny stories about performing with the Grizz Girls? Christina: During the second preseason game, all of us rookies were in la la land while dancing and did the whole routine wrong. I was so completely embarrassed at the time but now when I look back at that performance, I laugh. Taylor: My first year, we had this timeout where our entertainment group would pick two people to sing karaoke and the audience had to pick who they felt sang it best. This time it was the Grizz Girls turn to sing and I was one of the girls. The song was "Ain't Too Proud To Beg" by The Temptations. I know I'm not a singer and everyone in the FedExForum that day got to hear it. I had fun with it and it was definitely made for a good laugh. Are you a basketball fan? Who's your favorite Grizzly? Tabitha: I am definitely a huge basketball fan. To be honest, each player happens to be my favorite. I realize the vital role they each hold on court that contributes to the success of our team. Christina: I am a huge basketball fan. mike Conley is my favorite player because of his steady improvement throughout his career and he's an extension of the coach on the court. Taylor: I love basketball. It is the only sport I really follow. My dad raised me as a Memphis basketball fan since I was a little girl. Picking one favorite Grizz player is tough – I love all of our guys – but if I had to pick my favorite I would pick Mike Conley. What's the best part of being a Grizz Girl? Christina: Getting dolled up and dancing in front of a huge crowd. I am blessed to be dancing for such a great program. Its fun, entertaining, and is something I will never forget. Taylor: There are so many reasons why I love being a Grizz girl. I love working with a team. Performing and dancing is a passion of mine and this allows me to do that. I have one of the best seats in the house to cheer on our boys and get the chance to interact with the fans on a energy level that is indescribable. Tabitha: The best part about being a Grizz Girl is being an ambassador for the team. Many fans are unable to get up close and personal with players, but they are able to connect with us. I think that makes the fans feel closer to the organization.